Let’s see, the Olympics have been over a good 10 days now, and I’ve yet to post my final progress…I think that really sums it up! This is actually a pretty good (by pretty good I mean shows the whole thing in its bumpy, compressed glory–not that it reveals the pattern or anything) picture of my progress to date. A head cold at the start of the Olympics severely hampered my initial progress. Indecision. Was 12 repeats of the Yucca Chart enough? If I measure down the center and add 30%…or maybe I should just stretch and measure…or maybe…? 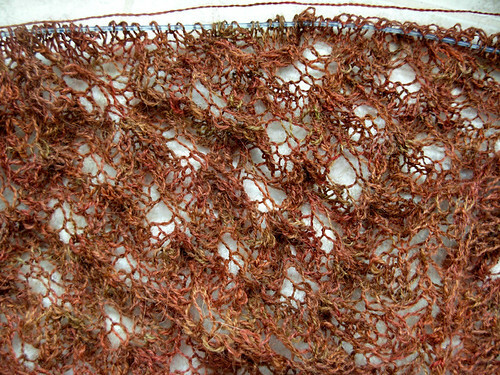 Answer: 12 repeats definitely not enough for my goal size (super-big). Let’s make it 16. The purl-back rows are really looooong. And slightly boring. Well, I was watching the Olympics, now wasn’t I? 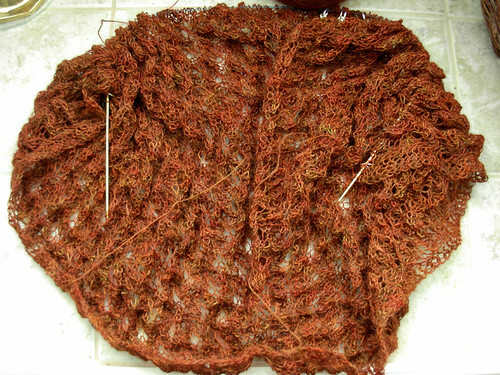 And finally, I really didn’t have enough time to knit a shawl this big (unless I took off a lot of work). I didn’t really expect going into this (realistically) to finish, so I can’t say I was too disappointed. On the contrary, I’m thrilled to have as much of this much-delayed shawl finished as I do (initially planned as a Fall ’09 project). As of this moment, I’ve finished the (16) Yucca repeats and the transition chart. Bring on the Agave! I can’t see the lace this time, but I love, love the color! It will be fun to see it all blocked out.